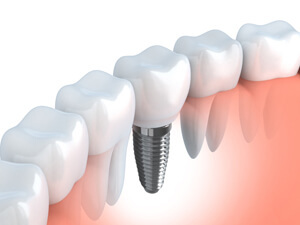 Dental implants are quickly becoming the preferred method for replacing damaged or missing teeth. Most patients with good oral health make ideal candidates for dental implants. The procedure has a 98 percent success rate. Dental implants are about as close as a person can get to actually having a brand new tooth, so dental implants have many advantages over the dentures and bridges of the past. Dental implants are comprised of two main parts, the replacement root and the crown. The replacement root is made of titanium and is surgically fused into the jawbone. Over time, the bone of the jaw bonds with the titanium post, which forms a strong and solid foundation for the replacement tooth. The crown is placed over the post and more closely resembles a natural tooth than any other type of artificial tooth. Most dental implants cannot be readily distinguished from natural teeth. when smiling for pictures and speaking in front of bright lights. After having dental implants installed, patients do not need to worry about their teeth moving, shifting, or clicking. Since dental implants are firmly fixed in the mouth, patients can eat nearly any desired food and can perform all other normal functions without fear that the tooth or teeth will become damaged or dislodged. Patients do not have to adjust to speaking with dental implants the way that patients with dentures have to adjust to speaking because dental implants feel natural in the mouth. Dental implants help to retain the facial structure, whereas dentures can allow the face to sage over time because the false teeth are removed every day. Dental implants keep the other teeth from shifting, which can help to maintain proper alignment. Maintaining proper alignment can help patients to easily reach all areas when cleaning teeth, so that dental diseases are more easily avoided. Dental implants also wear on natural teeth much less than false teeth or bridges. s life. Bridges and dentures typically need to be replaced after several years and are more prone to breaking and becoming damaged. Dental implants are made to be very durable and reliable.